Prime Minister Benjamin Netanyahu on Monday announced a new technological project that he said would help enhance Israel’s intelligence gathering capacity, at an international science ministers convention in Jerusalem. 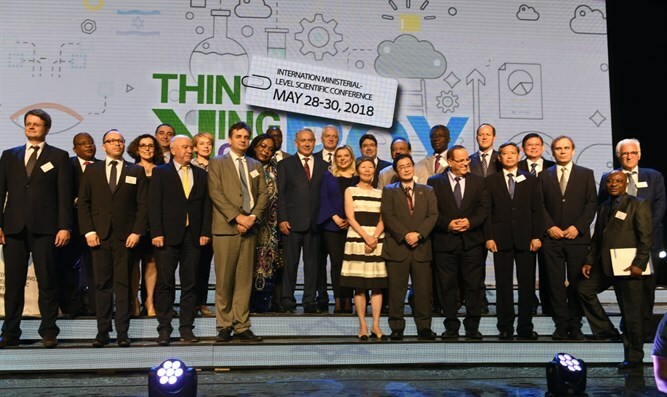 “I will soon declare the ‘technological scientific program to strengthen Israel’s security,’” Netanyahu told the crowd, which included science ministers and delegations from 25 countries as well as Israel’s Science Minister Ofir Akunis. “A team of experts will promote Israel in fields that are critical to security,” the prime minister added. “Among others, the revolutionary program will advance Israel in quantum technology. That field is vital for Israel’s intelligence. The field includes efforts to maintain secrecy in digital messages containing sensitive information. Scientists and leaders of international science organizations are also participating in the three-day event. It is a first-of-its-kind convention showcasing Israeli scientific achievements alongside discussions of new technological developments. Participating countries include India, Argentina, Poland, Thailand, Bulgaria, Uganda, Singapore and the Czech Republic. The convention’s second and third days will feature presentations from Facebook’s Israel CEO Adi Soffer-Teeni; award-winning Austrian-American neuroscientist Prof. Eric Kandel; Uri Levine, founder of navigation app Waze; and Jewish British scientist Prof. Robert Winston. This entry was posted on May 29, 2018 at 6:31 PM and is filed under Uncategorized. You can subscribe via RSS 2.0 feed to this post's comments. You can skip to the end and leave a response. Pinging is currently not allowed.